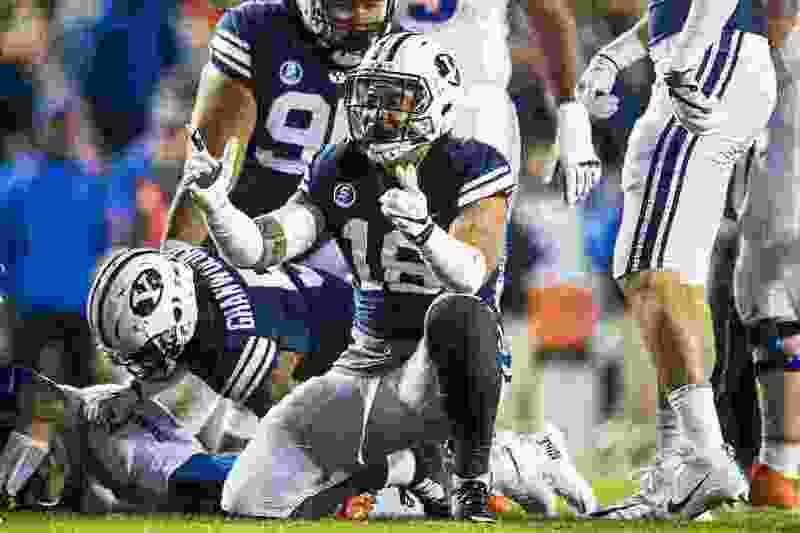 (Chris Detrick | The Salt Lake Tribune) Brigham Young Cougars defensive lineman Sione Takitaki (16) reacts after failing to recover a fumble during the game LaVell Edwards Stadium Friday, October 6, 2017. Provo • Linebacker was supposed to be one of the biggest strengths of the BYU football team in 2018, with plenty of experience returning and the addition of speedy senior Zayne Anderson from the safeties group. Anderson sustained a season-ending shoulder injury a few weeks ago and senior Butch Pau’u hasn’t returned to full strength since fracturing his right hand early in the season. But thanks to the emergence of redshirt sophomore Isaiah Kaufusi and improvement of veterans such as Riggs Powell, Adam Pulsipher and Rhett Sandlin, the position is still solid for a defense that ranks 26th in the country. Of course, senior NFL prospect Sione Takitaki continues to be the mainstay of the linebacking corps, and coaches have creatively and successfully used 6-foot-9 defensive end Corbin Kaufusi in the middle when facing teams with mobile quarterbacks such as Arizona’s Kahlil Tate, Utah State’s Jordan Love and Marcus Childers of Northern Illinois. “The linebackers have done a good job for us, even though we’ve had a lot of injuries there,” defensive coordinator Ilaisa Tuiaki said. Next year could be a different story, because all of the aforementioned players except Isaiah Kaufusi will exhaust their eligibility. Linebackers coach Ed Lamb will have to start over, and he knows it. That’s why losing Anderson before he had played in more than four games could be a blessing in disguise for the Cougars. The Stansbury Park product will count this as his redshirt year and plans to return for his final season of eligibility in 2019. Lamb also hopes that Payton Wilgar, Max Tooley, Christian Folau, AJ Lolohea and Jackson Kaufusi continue to develop and Hirkley Latu and Morgan Unga return from injuries that ended their seasons before they began. Freshman Alex Miskela, who signed last February, is expected to join the program in January. Lamb will start the rebuild with Isaiah Kaufusi, which is a surprise because the coach did not expect the Brighton High product to play a big role this season. He was BYU’s second-leading tackler in the 7-6 loss to NIU with seven takedowns, including one where he was originally flagged for targeting. The call was reversed by replay officials. Takitaki had 11 tackles. The 6-foot-2 Kaufusi weighed just 180 pounds when he left on his mission to Tonga for The Church of Jesus Christ of Latter-day Saints in 2014, but has added about 30 pounds to his frame and is still looking to add more. Isaiah Kaufusi, who is Jackson Kaufusi’s brother and Corbin Kaufusi’s cousin, said Monday that playing with confidence has been the key to his success. That defense, which held NIU to 204 yards and a touchdown, will get a much stiffer test Saturday at 6-2 Boise State, which is averaging 40.1 points and 486.4 yards per game. “It is a huge game, and we are going to have to play really well in order to win,” Kaufusi said. Flash • Riggs Powell, Sr.; Adam Pulsipher, Sr.
Middle • Sione Takitaki, Sr.; Butch Pau’u, Sr.; Corbin Kaufusi, Sr. Bow • Isaiah Kaufusi, Soph. ; Rhett Sandlin, Sr., Matt Criddle, Fr.